The film “Veer” will be shown on the opening day of the Princeton Environmental Film Festival at 3:30 p.m. on Jan. 2, 2010. The film’s director, Greg Fredette, is attending from Portand, Oregon, and will speak after the film. Veer explores America’s fast-growing bicycling culture by profiling five people whose lives are inextricably tied to bicycling and the bike-centric social groups they belong to. The film follows these characters over the course of a year, offering a behind-the-scenes look at their personal struggles and triumphs. Veer examines what it means to be part of a community, and how social movements are formed. The Princeton Environmental Film Festival runs through January 17 at the Princeton Public Library. Admission to all screenings and talks is free. A study by the New York City Department of Health and Mental Hygiene finds that 83% of those who walk or bike at least ten blocks each month describe their health as good, very good, or excellent. The positive relationship between better health and regular exercise holds true across all income levels. The study also includes a list of safety tips as well as recommendations on how to make physical activity a part of your daily routine. Exercising for just 10 minutes at a time can have positive benefits. Finally, this intersection along Route 571 is being made safer. The intersection of Route 571/Princeton-Hightstown Road, Wallace Road and Cranbury Road, one of the busiest intersections in West Windsor and the site where a pedestrian wearing a reflective vest was struck by a car last month, will become safer for those trying to cross the street. This is great news and comes two years after the West Windsor Bicycle and Pedestrian Alliance highlighted the safety problems there and made a number of recommendations. The New Jersey Department of Transportation is in the final design phase of improvements that will include marked crosswalks and pedestrian countdown signals at every corner. Lighting at the intersection will be brought up to code, if it isn’t already meeting the requirements. A sidewalk also will be added from the northwest corner (by the school bus depot) along the bridge to Washington Road, where a pedestrian crossing across Washington Road will be added. NJDOT also intends to add a left turn lane off the railroad bridge, which will eliminate what some pedestrians use as a refuge island. NJDOT intends to do the work in the spring or early summer of 2010 and says that funding is secure. (This is being paid for through federal pedestrian-safety funds.) It has decided not to wait for improvements promised by Rite-Aid, which is going back to the zoning board for permission to make some changes to its plans. The WWBPA was often told that this was a particularly difficult intersection because it involved Township, Mercer County and state jurisdictions. That the three entities have worked out a plan shows how the WWBPA can bring people together to find solutions. Lowering the desired operating speed, supported by roadway design elements, not just a lower posted speed. Adding bike lanes per the Township Master Plan. Strengthening the design cues to drivers when entering the main street gateways (e.g., by reducing the posted speed limit in the transition areas leading to the gateways to 35mph, reducing to one through-travel lane before the gateways). From Princeton and Plainsboro to beyond, plenty is happening to make our state friendlier for bicyclists and pedestrians. Princeton Township is building the missing half-mile link in the Stony Brook Regional Bicycle and Pedestrian Pathways and Bridges system, according to the Princeton Packet. This section will begin at the intersection of Route 206 and Hutchinson Drive and follow the property line of the JSJ Jasna Polana golf course, linking the Washington Oaks area with the Hun School of Princeton. Construction is expected to begin this winter , and the contract allows for completion in 2011. Plainsboro is making pedestrian safety improvements and adding traffic-calming measures on Plainsboro Road between Enterprise Drive and Deer Creek Drive. This will include planted medians, sidewalk improvements and some road reconstruction, according to the Packet. The New Jersey Bicycle Coalition, in cooperation with the New Jersey Department of Transportation , will host the first New Jersey Bicycle Summit on February 27 in Denville. State legislators and transportation policy officials will attend, as will three WWBPA trustees. Among the topics that will be discussed are “Complete Streets” design, three-feet passing and other legislation and a set of unified short and long-term goals. What are complete streets? This is a way to create more livable communities by improving safety for pedestrians, bicyclists, children, older citizens, non-drivers and the mobility challenged as well as those that cannot afford a car or choose to live car free. New Jersey adopted this policy in December. More groups are being formed to push for pedestrian and bicycle safety improvements. There’s now one in Cherry Hill and another in Red Bank, which also is mixing bikes and the arts in one event. NJDOT is making safety improvements to Route 9 in Freehold with pedestrians in mind. And Old Bridge is developing a network of paths. Windsor and neighboring communities more bicycle- and pedestrian-friendly. This is an excellent way for students to make a difference in their community while developing organizational skills, helping to plan and publicize events, and learning to lobby local government. The deadline for applications is Jan. 15, 2010. Click here for student advisor requirements. A number of groups, led by the West Windsor Bicycle and Pedestrian Alliance, are funding the installation of additional bike racks and lockers at the Princeton Junction train station to alleviate the overcrowding there. Eight bike racks (room for 16 bikes) will be installed on a concrete pad in the triangle between the Trenton-bound and Dinky tracks, where two concrete pads for racks already exist. Another concrete pad, also for eight racks (16 bikes), will be added to the northbound side along the walkway to the Wallace Road parking lot (and next to bike lockers). Individual lockers for 10 bikes (in five gray containers) will be added along the Dinky tracks where a similar number of lockers already have placed. These should essentially eliminate a two-year waiting list. The concrete pads were poured just before the snow came this weekend. New Jersey Transit is providing the racks and lockers. West Windsor Public Works is handling the installation, which will happen in early 2010. The cost for the concrete pads, at just over $6,000, is being shared equally by the WBBPA, BikeFest, the West Windsor Parking Authority and Greater Mercer Transportation Management Association, which among other things manages the locker rentals. Those interested in renting a locker should call GMTMA at (609) 452-8988. West Windsor is a great area to live in. It has a great school district, a wonderful mayor, many serene parks, and the second largest train station in New Jersey for commuters. I personally like my town, and I take pride in riding my bike to the Aljons to get a slice of pizza or delicious garlic bread, or to the library to pick up some books or DVDs, or even to the train station to take a ride into Princeton. I enjoy this, but the fact is that West Windsor has dangerous roads. Just look at North Mill Road, South Mill Road, or Clarksville Road and look at the high speed limits, low police presence and dangerous risks pedestrians have to take to cross the street. Cranbury road going to Grovers Mill road has no sidewalk, forcing pedestrians onto the 50 m.p.h. speed limit roads. Wallace going toward Alexander Road is an extremely dangerous speedway during rush hour, yet there is no police presence at this time. Has anything been done to make roads safer? Yes. There is, in fact, an organization known as the West Windsor Bicycle and Pedestrian Alliance (WWBPA) that campaigns for safer roads. You can join this group. For more information go to wwbpa.org, the group’s website. What else has been done? The West Windsor town government has completed a project known as the Dutch Neck Village Safety Improvements. This project was completed to lower the speed limits on Reed Drive, Oakwood Way, and South Mill Road. Also, following the 2005 automobile death of Rebecca Annito, the S curve that she died on was re-stripped and remodeled. Have these solutions helped? Yes, they did help, but have they really helped enough? No, they have not completely solved the the problem. Several incidents have happened due to unsafe roads. On March 3rd 2008, an 18-year-old high school student, Christopher Dittrich, swerved off Route 571 and hit a tree, critically injuring himself. Dittrich was sober and wearing a seatbelt, and the airbag worked properly. Route 571 has a speed limit of 50 m.p.h., and it has many dangerous bends and turns, so this high speed limit should definitely be lowered by a significant amount especially on the route’s danger zones. Jaquan Wilson, a 22-year-old from North Brunswick was killed in an accident on Village Road West, on January 15 2009. At the North Post Road intersection, his car smashed into a utility pole. The speed limit again is the problem and without doubt it has to be lowered from its 45 m.p.h., to 25 m.p.h. at this dangerous spot. I could keep going with West Windsor automobile deaths but I will not continue the depressing topic and get to the root of the subject. I will leave it to the reader to understand how pertinent the problem that we are dealing with is. Now, after reading this editorial, please keep the WWBPA in your mind. Look at the website, maybe give some donations, maybe sign a petition, maybe just join the group. Anything you do with this group will help create safer roads. The more support the WWBPA receives, the less chance there is of innocent people dying. Keep safe. Editor’s note: The writer is a ninth grade student at High School North. I have a suggestion for improving the safety of pedestrians attempting to cross Hightstown Road in Princeton Junction. It is based on the experience of my children, one of whom is special needs, and both of whom walked to High School South by crossing Hightstown Road. It is also based on my own experience. Two weeks ago, I was struck while crossing Hightstown Road at the Wallace-Cranbury and Hightstown intersection. I was returning from work from the train station about 6:00. I was crossing in the crosswalk (on the Acme side of the road), at the proper time, and although it was dark, I was wearing a reflector vest. The driver that struck me just wasn’t looking to see if anyone was in the crosswalk. I assume that the driver was looking either straight ahead to see if someone was making a left turn from Cranbury on to Hightstown, or looking left to see if anyone was running the red light on Hightstown, as sometimes happens. There is only one way to make crossing the street safe for pedestrians. There must be some segment of time in which no cars are allowed to drive through the crosswalk. And the only way to create that time is with colored arrows. In other words, we need arrows that control turns. The system should be set up so that you can turn left (right) if and only if the left (right) turn arrow changes from red to green. A system of colored turn arrows would also reduce the number of car crashes, many of which I am sure are caused by the game of chicken that is played when someone is trying to make a left turn, say from Hightstown Road on to Wallace Road. And I think it is possible that with the use of sensors the system could improve the flow of traffic by allowing long queues of cars waiting to make left turns to empty. Tuesday’s meeting about Princeton-Hightstown Road essentially put preliminary engineering drawings on a concept that the Township had drawn up a few years ago. The plan calls for a single lane of traffic in each direction plus a shared turn lane in the middle for most of the stretch between Cranbury/Wallace Roads and Clarksville Road. The number of lanes would expand to three, including a dedicated left-turn lane, at intersections. Sidewalks and paved shoulders for cyclists would be added. It does not call for altering the speed limit, now 40 mph. The consultants from Louis Berger stressed that this plan is aimed at improving safety, not capacity, on this road, which had 154 accidents in three years from 2005 through 2007. This is 50% more than the statewide average for similar roads. The next step is an environmental study and more detailed design plans. This could take one to two years. The harder part is coming up with the millions of dollars needed to fund the project. How will High School South students safely cross 571 from the Sherbrooke neighborhood if additional lanes are added? And to the Arboretum if a right-turn lane is added in the style of the one at Penn-Lyle and Clarksville, rather than a turn lane at the traffic light? How about a pedestrian-activated signal at Sherbrooke? NJDOT guidelines for a Town Center call for speed limits of 25 mph to 30 mph. Why not do that here? What happens to making this part of town comply with the Americans with Disabilities Act if the project is scaled back? Where are the bike lanes that are in the concept drawing and in the master plan? Click here for the Power Point presentation from the Public Information Meeting on Tuesday, December 15. The WWBPA will submit comments on the design shortly and will post them here. You can send your own comments using this form. Click here for Princeton Packet report on meeting. 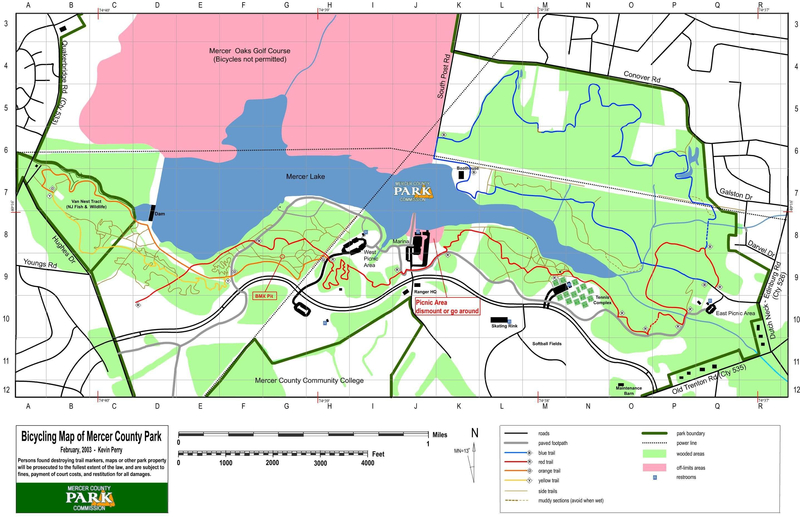 Mercer County Park and the adjoining Van Nest tract have 16 miles of marked off-road trails. A group called SMART (Save Mercer and Ride the Trails) has permission to mark and maintain the trails in both areas. SMART has been working to improve the trail layout, and its next monthly trail day in the park is Saturday, December 19. The meeting point is 9 AM in the marina parking lot at the end of South Post Road. Work generally finishes around noon or 1 PM. Bring something to drink; tools and gloves will be supplied. If the weather is questionable, check SMART or Jorba.org after 8 AM on Dec. 19 for a cancellation announcement. Contact Mick at smart.jorba@gmail.com for more details. He will email volunteers with the Saturday plan at the beginning of the week. SMART recently was asked to do the trail maintenance at the Ted Stiles Preserve on Bald Pate Mountain. This is also is part of Mercer County Parks Commission land. Trail work there will be done twice a month. Read our letter in the December 11 issue of the Princeton Packet about the need for improvements at the intersection of Rt 571/Princeton-Hightstown Road and Cranbury and Wallace Roads. It’s time to see changes. Click here for more. A right-turning car struck a pedestrian as he was crossing Route 571 (Princeton-Hightstown Road) at the corner of Wallace Road at 6 PM on Monday, November 30. As was his custom, he was wearing a reflective vest. Fortunately, there was no neurological damage, and no bones were broken. The WWBPA recommended changes to this intersection in 2007 and continues to push the Township, County and State to improve the intersection. Until (and even after) these changes are a reality, one resident recommends using a red, flashing light when out after dark. Also, please attend the meeting about Route 571 (Princeton-Hightstown Road) on Tuesday, December 15 between 6 PM and 8:30 PM at the West Windsor Municipal Center. Let’s ensure that this intersection is improved for the safety of pedestrians, bicyclists and motorists. This information meeting, conducted by the Delaware Valley Regional Planning Commission (DVRPC) and Mercer County Engineering Division in conjunction with West Windsor Township, will show improvements being planned between Cranbury/Wallace roads and Clarksville Road. Plans will be on display beginning at 6:30 P.M. on December 15, and DVRPC and County representatives will be available to answer questions. A formal presentation of the project will begin promptly at 7 P.M.
Bicyclists must follow all the rules that motorists do. And yes, that means stopping at red lights too. It’s not just the law – it’s the safe thing to do. Safe for you, safe for pedestrians, safe for motorists. Philadelphia is cracking down on rogue cyclists. So is the Bay Area. For those who need a reminder about bicycle rules, click here. Don’t forget to click on videos in the tool bar. And for even more on the film clips, check this out. Comments Off on Stop. Look. Signal.